My Drug Hell’s guitar hooks get right into you. You’ve heard them before, on the radio, at a party, in a record shop, you might even already own several of them, particularly if there are any Arthur Lee albums in your collections. But whereas today “Forever Changes” sounds audacious and not a little challenging in its determinedly right/left stereo channelling, My Drug Hell is determinedly harking back to mono, and to a quite specific mid-60′s moment that possibly never actually happened. Right when the beat boom went a bit folk rock, My Drug Hell’s imaginary precursors stuck their necks out and downright refused to leave the garage. 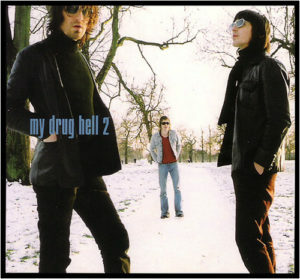 My Drug Hell’s first album was released in 1998, and when you’ve spent around a decade re-assesing your ability to place your own indelible stamp on a style of music that can include the work of bands as diverse as The Kingsmen and The Archies, the big questions are how to make certain that you not only get heard but also actually take things more than one step beyond the near-iconic originals that My Drug Hell so obviously wish to emulate? Firstly, there’s the band name, and that’s undeniably an attention grabber. 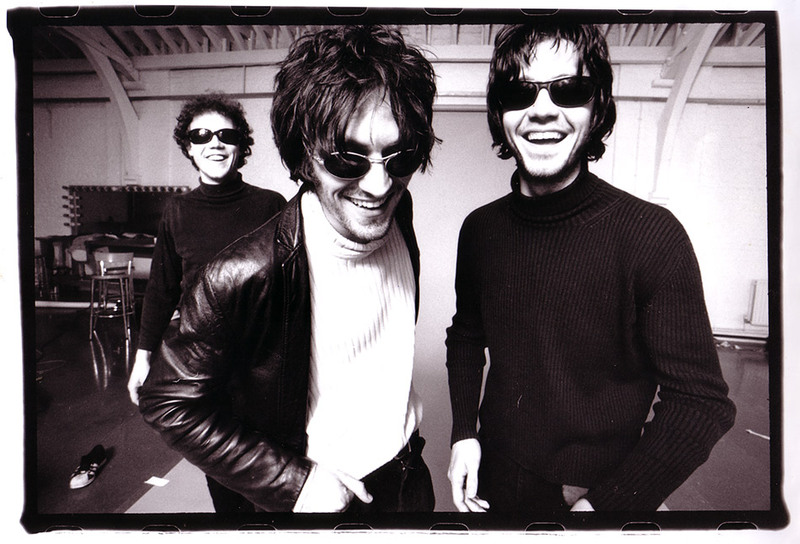 But secondly, My Drug Hell chooses to underproduce its songs, relying on the band’s playing and writing skills to carry the day rather than layering on great swathes of reverb and phasing as you might expect a bunch of reverential mid-60s recreators to do. This gives parts of the album the feel of practically a demo recording, one whose live-in-the-studio energies provide the songs with an impetus a more involved production style might drain them of. So the members aren’t perhaps great originals or even innovators, but this hasn’t prevented them from making one of the most interesting albums I’ve heard this year. The enthusiasm carries, the trio crank it out like it is actually 1965, and those deceptively throwaway song intros don’t really sound like anyone else. The album opens with “You Don’t Need Me Today”, a tale of rejection and pride taken at a breakneck pace, and My Drug Hell songs are for the most part fast and frenetic (“Nightgames”, “Garden Party”) or soulful or even a bit funky (“Waiting For Anna”, “Mysteries Of Love”) while the imagery is garage punk gone 70mm cinema (“Nowhere Town”, “D Is For Delinquent”). The band take a spin around some counter cultural reference points (“Goblins, Mermaids And Things”) but it’s the blank shrug of “Something’s Not Quite Right” that most succesfully captures the air of defiant nihilism My Drug Hell really wants to create, a song that expresses the sullen nervousness of real and far better known classics such as The Seed’s “Pushing Too Hard” or even Iggy Pop’s “I’m Bored”. My Drug Hell is obviously made up of either serious perfectionists, or their lucrative day jobs take up a lot of valuable guitar time. It’s been worth the wait though, My Drug Hell 2 is both a tribute to some of the greats of the 60s garage scene and a very listenable and modern sounding album in its own right.